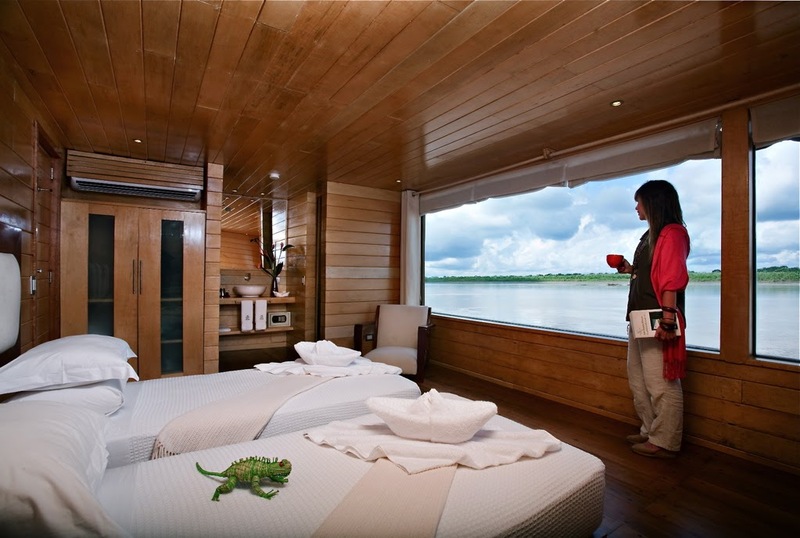 Enjoy an intimate trip along the Amazon with this four or five-day river cruise. Explore the tributaries and flooded forests of the Peruvian Amazon from the water as the riverboat travels up the Ucayali River. Kayak up small tributaries and into hidden lagoons for an up-close view. Spend time listening to the birdlife and wildlife, and note how the concert changes with the time of day. Watch playful river dolphins as they feed and frolic. Meet some of the area’s indigenous villagers, whose families have thrived in the remote jungle for generations. This trip of a lifetime gives you the chance to explore the beauty and splendor of still-largely-unknown part of the world. Enjoy an early-morning exploration of Belluda Cano Creek, one of the tributaries that feeds into the Pacaya Simiria Reserve. Get up close and personal with the gray and pink river dolphins in a skiff. Spot a variety of local birdlife as they take flight. After your gourmet breakfast on the boat, you’ll head out on a skiff to explore Clavero Lake. View the diverse plant life and wildlife that is unique to this part of the rainforest. Next, you’ll climb into a kayak for a trip along the Yarapa River. Explore the riverbanks up close as you peer deep into the jungle and listen for the sounds of its inhabitants. Your guides will be waiting at the Iquitos airport when you arrive to take you to Nauta, a small riverside port city about an hour and a half away. Lunch will be provided along the way. 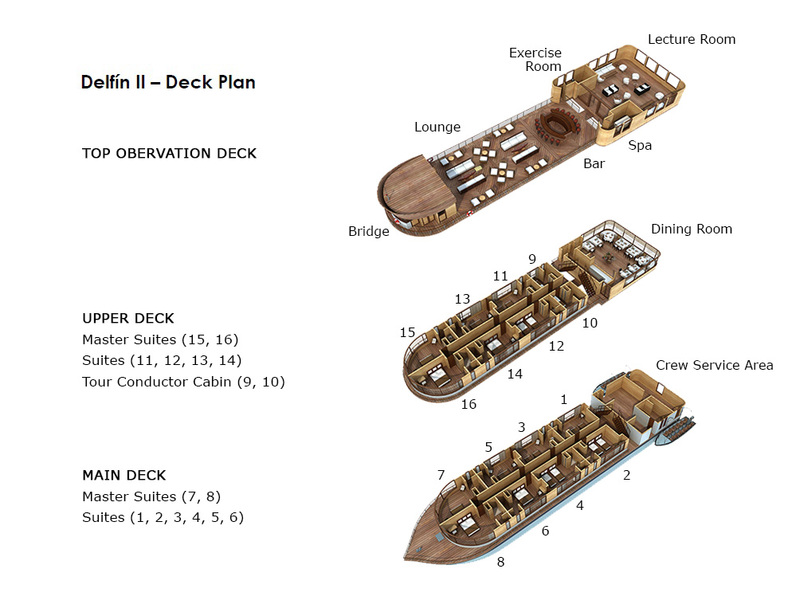 In Nauta you will board the Delfín II and meet the boat’s staff, who will help you settle in to your private quarters, complete with orthopedic beds, air conditioning, private bathrooms and private terraces. You’ll start the day with an early-morning trip along Belluda Cano Creek, one of the tributaries of the Pacaya Samiria Reserve. You’ll get a chance to enjoy the intimacy of an encounter with gray and pink river dolphins from a metal skiff. You’ll also see a number of early-morning birds, out looking for breakfast. This morning you’ll head out in a kayak for a quiet paddle along the Zapote River. Your guides will lead you upstream in search for prehistoric iguanas sunning themselves on the riverbanks. You’ll also hear and see squirrel monkeys as they noisily move in their family groups from the mid to upper levels of the lowland forest. Today you’ll explore Clavero Lake as the boat heads back toward Nauta. Climb aboard the aluminum skiff for the chance to take a close up view of the diverse flora and fauna along the lake’s banks. In the afternoon, you’ll explore the Yarapa River via kayak. Enjoy a peaceful paddle along the banks, listening for the local wildlife as you keep an eye out for colorful feathers and wings. Visitors may find one of several distinct climates in Brazil, depending on where they travel. Along Brazil’s northeastern coast, temperatures are mild year-round, rarely dipping below 75F. The summer rains, usually lasting three to four months, arrive as early as April here, consisting mostly of quick showers. Rio de Janeiro is pleasant year-round with slightly cooler winters than summers. Rio’s rainy season begins as late as October though rains can occur anytime of the year. Further down the coast, temperatures are more variable. Visitors will experience the most temperature variation between seasons in the south, with hot humid summers December to March and cooler temperatures in the evenings and during winter from June to August. In the country’s interior, the hottest, wettest weather occurs from December to March. So vast is the Amazon Rainforest that its climate varies by sub-region. The north is rainy most of the time with a little less rain from June to December. In Amazon areas further south, especially around the largest population centers where there are fewer trees, temperatures are more variable with distinctly drier months between August and October. **The summer high season in Rio is December to March. Off-season (May-October) is also a good option since Rio’s winter temperatures stay around the 70sº F/20sº C, dipping occasionally below 60ºF/15ºC. Rainy days are unpredictable andcan happen even in the high season. **For the central Amazon region (Manaus) the average daytime temperature in the rainy season is in the mid-80º F (30º C), with a fall of 10 to 20º F (7 to 12º C) at night. In the dry season the average temperatures are 5º F (2-3º C) higher. Although recipitation varies significantly within the Amazon due to various factors (e.g. altitude) it is usual to consider two distinct periods: the rainy season, and the dry season. In the central zone (Manaus) the rainy season begins in December and lasts until mid-May. **The rainy season lasts from December to March. The intermediary seasons are April-June and October-November. During the rainy season rain storms can be intense, the temperature is high and the Pantanal is subject to flooding. 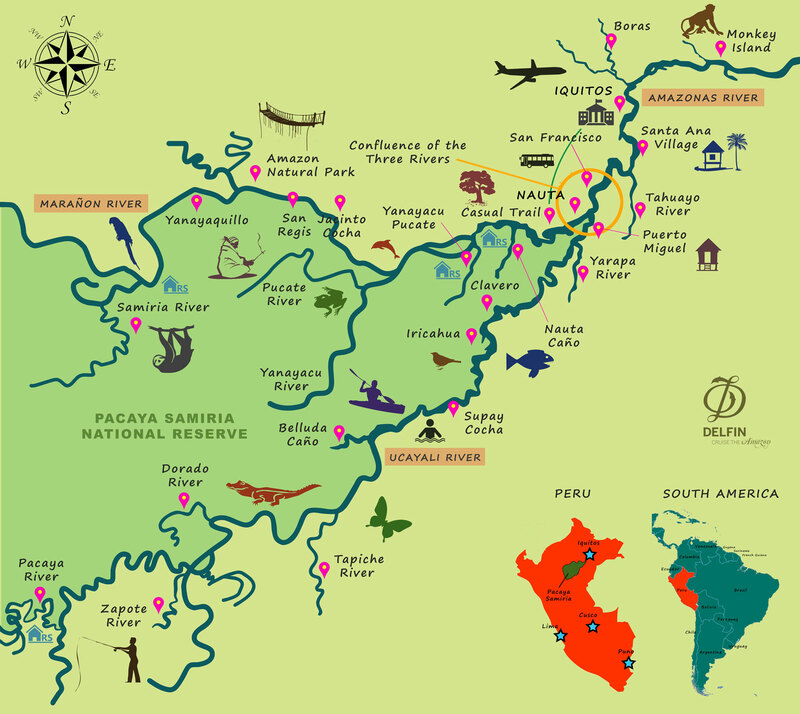 This isn’t the best period to visit Pantanal, particularly January and February. It’s much better to visit the Pantanal in the dry and intermediary seasons. **Salvador, Fortaleza, Recife and nearby resorts (Praia do Forte, Porto Galinhas, Natal, etc.) have agreeable temperatures all year round, rarely dipping below 25ºC (77ºF) and there are very few days hotter than 32 or 33ºC (90ºF). Winter temperatures are just 3-4ºC degrees below the summer averages. In Salvador and Recife the rainy season begins around the beginning of April and lasts three months. At Fortaleza the rain begins a little later. Rain showers usually don’t last enough to spoil your visit to these year-round beach resorts. **March-November could be considered the best time to visit Iguazu Falls but there really isn’t a 'best time'. 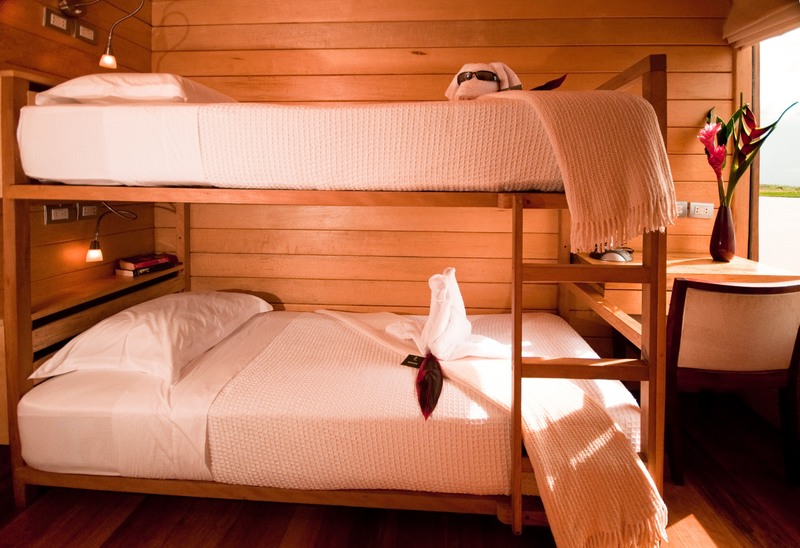 The high season is in January and February, when most Brazilians and Argentineans are on vacation. It’s a good period to visit Iguazu Falls. But there are downsides, the humidity and the heat are also at their peaks and this is also a crowded period which you might prefer to avoid. If you want to avoid busy periods then avoid Easter time also. May and July are rainy months, though the rain is rarely a problem and the volume of the falls is at its highest. **The coastal city of Florianópolis enjoys a semi-tropical climate, without extreme variations in climate so any time of year is a good time to visit. It just depends upon your preferences. Winters are mild and summers hot with an average of 80% humidity. Rains should be expected from September through March. Mid-winter (June to August) is drier than summer, but anticipate cooler temperatures then as well. That said, even the coldest temperatures brought in by southerly wind will rarely drop below 50 Fahrenheit. The windiest days are most likely during the spring months of September and October for those interested in trying their hand at kiteboarding. The busiest time on the Island is in the summer months from December through mid-March, so those looking for a more peaceful trip should travel during the winter months. *Contact us for details on cabin upgrades and single supplements. Dining room for up to 32 passengers. Indoor lecture room & lounge. 4 Master Suites with 90-degree wrap windows.